The sponsor chapter will hopefully be released to get you guys off a cliff but however I cannot guarantee it as it all depends on whether my editor has time.. If possible please add this to your Novel Updates Reading List do leave a review as well. “How about this… Ai Wei Er, you can be the leader; girls are calmer and everyone has gathered at your request. Is that alright?” Ya Se suggested. Everyone nodded one after another and Ai Wei Er also did not decline; not only was this the salve for the two’s compromise, but her ideas had always been the best in the past. Since their Beast Spirit had an anaesthetising effect, most of the top doctors were all of the Rui Bo Te tribe. Not only that, but the tribe made up the main power of the Medicine Masters Guild. Though each person had a back to carry things, the sizes between them differed. Only Ou Nisi Te carried two enormous bags, and that was after an attempt to reduce the amount. It was fortunate that Ai Wei Er had prepared a horse carriage for the people who were going to the underworld. Eight elite horses pulled a gorgeous carriage at an impressive speed, and these horses had bulging muscles that made them much stronger than the ones on Earth1. Without this, pulling so many people would have consumed a lot of strength. The carriage was very large and comfortable, and naturally a group of youngsters together would not lack for conversation topics. It was not the first time Ke Te was heading towards the underworld, though in the past he had gone only as a sightseeing visitor and now he was part of the main force. “Have you heard that recently a person known as a Beast God Martial Artist has appeared in the Beast Spirit World?” Lan Di asked. Of the three he was more entertaining to talk with and had a more carefree attitude, aside from the times he was going head to head with Ke Te at least. 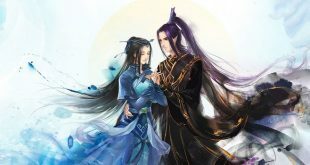 “I think so too, however this fellow has triumphed over Andongni-Lika, so he must have some ability,” Lan Di replied. Though the Shadow Hunter Guild was in a province rather than a city, each city’s occupation only had a few renowned people. With so few numbers, they would naturally have a mutual understanding of each other. Ke Te and Lan Di’s arguments always happened since neither of them wished to lose against the other. Ao Li Quan Ya to the side was endlessly excited for the trip and showed no interest in these two boy’s argument. When Ao Li Quan Ya was pleased she would carelessly release a hair-raising charm strong enough to even make Lan Di and Ke Te forget what they were arguing about. But Zou Liang did not buy it, instead giving Ao Li Quan Ya a sideways glance. The pouting Ao Li Quan Ya’s cheeks puffed up like an inflatable bag; she was very, very unwilling to continue like this, but as a majestic War Song Priestess she had to uphold her promise. The sound of ‘Big Brother’ would make all of Zou Liang’s strength leave his body2, but he enjoyed this feeling nonetheless. “This Asura is very strong. If you have a chance to encounter him, you must be very careful,” Ai Wei Er imparted. “Ai Wei Er, do you have any more recent news?” the silent Patelisi asked. The eagle tribe was not many in number but most were outstanding archers. Patelisi’s interest was caused by the renowned eagle tribe member Sheng Feibo fighting in his own Battle of Waterloo after meeting the Flight Restriction War Song. “No one knows much about this Flight Restriction War Song. The battle power could be even stronger than the Bisi Mai’s by a bit and it not only can stop flight, but it can also knock the opponent out,” Ai Wei Er replied. The strength of her family’s intelligence network was already well-known by the three others. “Oh, you mean that this combines an offensive war song and a Flight Restriction War Song?” Ke Te asked, his eyes filled with interest. Of all of the people present, Ai Wei Er was the most learned since she generally loved reading books, occupational ones included. The Rui Bo Te tribe would not usually have such experience, but Ai Wei Er was a special case. Ao Li Quan Ya knew this as well since she herself was very similar. Ao Li Quan Ya explained with a measure of pride. It seemed as though the Bisi Mai family’s pride—the Flight Restriction War Song’s strength—had been exaggerated. “What Ao Li Quan Ya said is the truth, but the Bisi Mai are born to possess this kind of ability while other tribes cannot,” Ai Wei Er agreed, nodding her head. “Who cares about him? If there is a chance to meet with him, I’ll give it a try then,” Lan Di stated while stretching. What youths possessed most was a lack of fear. Everyone chatted and bickered along the whole road leaving nobody lonely, and even Ou Nisi Te started to join in; only Patelisi had less to say than the others. After getting to know him, it would become clear that it wasn’t that he was cold, but that it was a habit of the eagle tribe to rarely speak. Along the way, Ao Li Quan Ya made an observation: he had such a large nose and it was very angular…… it could even be used to hang clothes. The horse carriage traveled quickly for half a day before stopping at their destination as the night fell. Though the people of the underworld were distributed all over the Among De continent, Ye Lu Samo City did not have such a location within its vicinity. They instead had to travel west to the nearby Fasi Te (Fǎsī tè) City. They had passed a considerable number of small villages and tribes from the city’s outskirts along the road. The sights had aroused a new and odd feeling for Zou Liang, but in the eyes of others it was simply excitement due to ignorance. This also lined up more with the traits of a Bi Er: honest, simple, and curious while showing all of their expressions on their face. The supplements for risk takers and people undertaking a trial by fire were not complex and could all be purchased in villages. Along the road, there would also be taverns, inns, and pubs according to each of the tribe’s styles. These had only been created after the demon beasts invaded the beast tribes five hundred years ago, where the beast tribe population entered their high-speed developmental period. The economy was reformed, their military might quickly rose3, and that time period’s Pope—Benduma (Běndǔmǎ) the Third—was hailed as the mightiest of them all. He led the beast tribes towards glory and the Meng Jia Empire became a giant of the Among De Beast God Continent. Wherever there were needs, there were businessmen. This road towards the trial by fire didn’t lack businessmen; it was easy to make money off others that were going to take part in one. ”There is a pub ahead; everyone can rest there for a while,” Ai Wei Er directed. This was one of the reasons why Ke Te and Lan Di enjoyed going on trials by fire with Ai Wei Er: the map would be memorized in her head, and she was effectively a know-it-all. Zou Liang alighted from the horse carriage and looked to this place that appeared like a castle. Its style signified that the boss was from the Wo Fu wolf tribe, the hanging fangs at the entrance being a favorite of theirs. The farther one was from the city, the more prominent the tribal styles would become. Zou Liang—who had come from another place—was filled with curiosity while the others did not have any such interest. The other member of the group to attract attention was Ao Li Quan Ya. This was the first time that this beauty had come to such a place and had very successfully attracted everyone’s focus. When someone left their home territory, it was necessary to keep a low profile unless they weren’t afraid of stirring up trouble, and it seemed as though Ao Li Quan Ya was not the type to lay low. With such an innocent, pure, and beautiful little angel appearing, countless scorching gazes flocked over. Being stared at by a group of grown males made Ao Li Quan Ya very displeased. It was not just Ao Li Quan Ya, but Ai Wei Er was the same as well; even though she had concealed much of her figure it would still arouse the males’ curiosity. It was common knowledge that a Rui Bo Te’s beautiful figure could allow a male to ascend to Heaven.